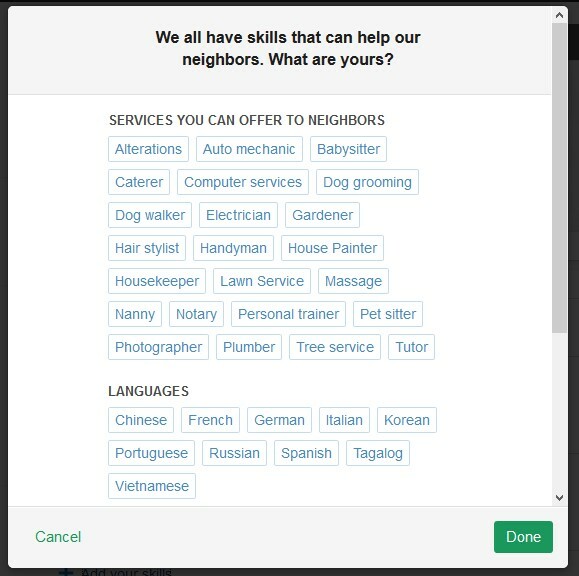 Nextdoor™ is a free private social network for neighborhoods. With more than 81% of neighborhoods in the nation represented, yours is no doubt one of them. All members are verified to live in the community and 72% are homeowners. 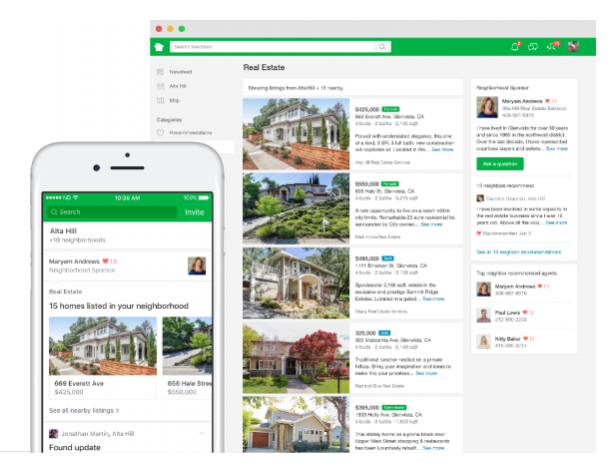 It’s the engaging place where homeowners can get to know, like and trust you, and that’s why every real estate agent should be on Nextdoor. Here are some tips on how to use it, as well as how to sign up. On Nextdoor, neighbors communicate about everything from missing pets to recent burglaries to used furniture for sale. One thing they routinely ask for is referrals for services. This is where you can tap your list of trusted contractors for painting, roofing, carpet-cleaning, etc. and become the trusted source in your neighborhood. One thing a Nextdoor personal account is NOT for is promoting your business. Nextdoor has strict rules about what real estate agents can and cannot do with a personal account. It’s solely a site for you to be a good neighbor and demonstrate how passionate you are about your community. Yes, you can respond if someone is asking for recommendations for a real estate agent, but do it discreetly and invite them to chat with you by private message. 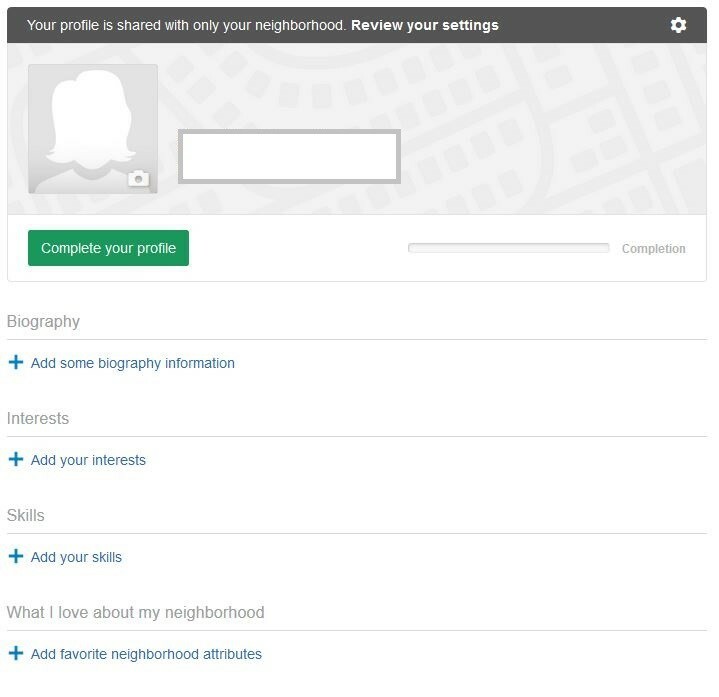 You can only sign up for the specific neighborhood in which you live, but when you post something, you’re given the option to have your post seen in surrounding neighborhoods as well. So, you’ll often see requests from people in other neighborhoods in your feed, as well as your own. Unlike the personal account, you can claim your business page. Similar to your personal account, there are strict guidelines to follow with your business page. You can, for example, recommend your own business, but you must disclose your relationship to the business. You may not post commercial events to the news feed, but they can be posted to the events calendar. Business pages are free. Branded Listings are an opportunity for you as a selling agent to build your reputation in your community by including personal branding alongside each of your listings. It’s a relevant way to promote your business. The listing agent’s name and contact information will appear at the bottom of every listing, branded or not, but on Branded Listings, there will be a designated section on the listing page that includes the agent’s name, picture, bio preview, recommendations, and a button for a member to ask a question. 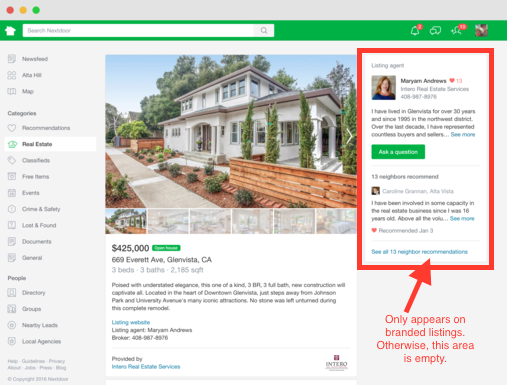 Currently, real estate agents cannot directly upload listings to Nextdoor. 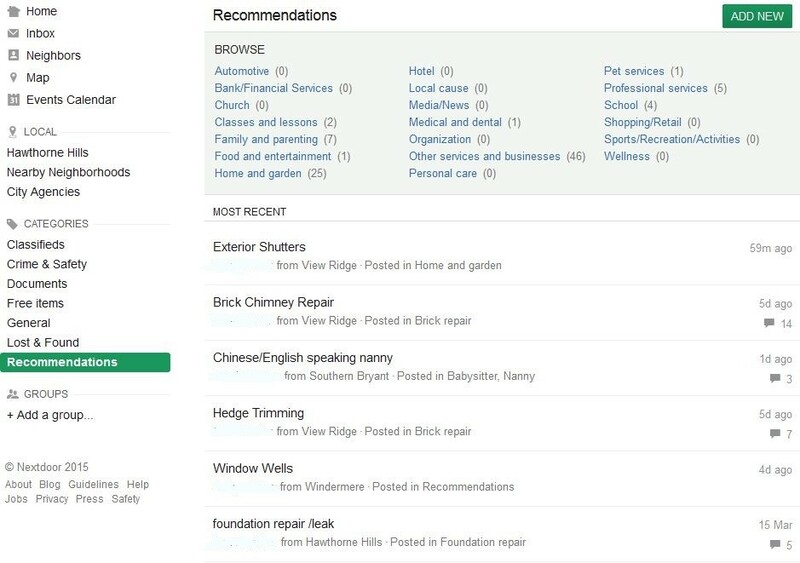 Nextdoor receives listings from brokerages, MLS relationships, and other third-party companies. They are actively working with brokerages and the MLS to add more listings, which will take some time and, in the beginning, it is unlikely that you will see all available listings on Nextdoor. Here is their list of markets with the real estate product. You can sponsor a neighborhood and become the face of the neighborhood, showcase your market expertise and build relationships. These are sold on a first-come, first-served basis. Every real estate agent should be on Nextdoor, one way or another. After all, it’s your neighborhood! Remember to subtly mention your business in Biography. When you’re working with a new seller, recommend that they promote their home on their Nextdoor group. This is allowed. Recommend it in a welcome packet when you sell a home. Ask satisfied customers to add you to the list of recommended professionals on their neighborhood site. Motivate neighbors to help in the community – organize a day to clear weeds from the public pool in spring. Repair the fence of an elderly neighbor. Plan a block party. Be visible as a good neighbor. Once you’ve signed up, you’ll receive a daily e-mail summary of your neighbors’ posts. Be sure to download the Nextdoor app on your phone, so you can answer questions on the go. Need Facebook post ideas? We’ve got you covered with our Free eBook that’s full of ideas.